Where do I use my Vivomed voucher code? 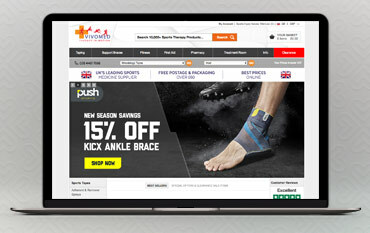 Viomed stocks a huge selection of sports medicine and first aid products which includes tapes, support braces, fitness products, first aid essentials, pharmaceuticals and other treatments. Discover adherent and remover sprays, bandages, wraps, a variety of different tape, grip enhancers, tape scissors, underwrap, supports for all areas of the body, foot braces, mouth and nose guards, muscle rollers, rehab clothing, strength and conditioning products, wobble boards, gym balls and balance equipment, resistance bands, skincare, medicines, wheelchairs, essential oils and much more. If you’re looking for specific treatments to help with an injury then Viomed also offers a treatment room where you can find a huge selection of products to help with any bump or bruise. Find blister treatments, diagnostic equipment, dressings, infection control, padding, surgical equipment, sutures, acupuncture kits, massage accessories, hot stones, trainers tables, orthotics, heel raisers, cryo, heat therapy, electrotherapy, warming and cooling treatments and pain relief. Fitness is a huge part of all sports, and when you become injured your stamina and fitness ability can decline massively, especially if you sustain an injury for a long period of time. To ensure you stay fit, or to get back into shape, you need a range of specialist equipment that will ease you back into your sport; supporting and aiding you through your injury to ensure you recover properly. You can find all the fitness products you will need to aid in your physiotherapy and fitness journey at Viomed. These products include yoga and pilates equipment, foam and muscle rollers, resistance bands, loops, tubing, rehab clothing, rehabilitation and therapy equipment, strength and conditioning equipment, watches, heart rate monitors, activity trackers, wobble boards, gym balls, balance equipment and rehydration. As well as specialised sports equipment and treatments, Viomed also has a great pharmacy section on their website. Here you can find all kinds of health essentials including deodorants, homoeopathy and holistic healing, medicines, self-testing kits, mother and baby products, organic lip balms, essential oils, skin care, bathing products, household aids, kitchen and dining aids, toileting aids, razors and even wheelchairs. All these products come from top brands in the industry such as Anadin, Gaviscon, Nurofen, Lemsip, Kleenex and many more. All the products available from these brands are extremely affordable and many are even discounted too. Since its establishment in 2000 Vivomed has become one of the leading sports medicine suppliers in the world. With one of the widest ranges of sports medicine products available anywhere, as well as a team of medically qualified professionals, Viomed efficiently supplies a range of first-aid, physiotherapy and medical equipment, with help and advice when needed. Shop online with a Viomed voucher code from us and save a fortune on all your medical products, you can also enjoy great savings in the clearance section or when you sign up to the newsletter.